What is sharepoint Search Center in SharePoint? Search Center site in SharePoint provides an interface for users to submit search queries and get search results similar to any other search engine. A Search Center site is typically a top-level site of a site collection that provides central search facility. How to Create Search Center Site Collection? Creating search center is quite straight forward. 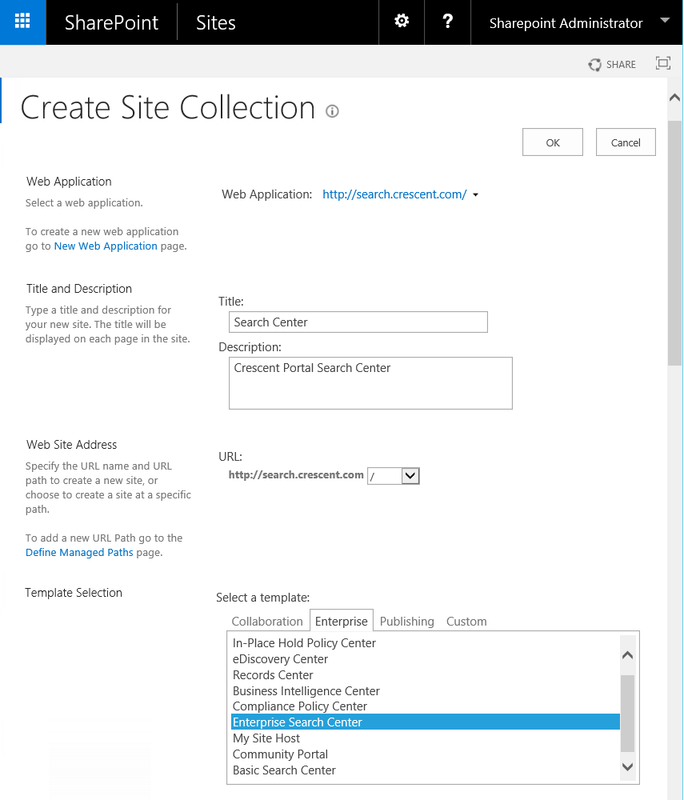 Key it: Select Search Center template while creating site collection / subsite to create search center in sharepoint 2013. You can create a search center either with Enterprise Search Center template or Basic Search Center template. The difference between Enterprise Search Center template and the Basic Search Center template is the ability to customize user experience. In an Enterprise Search Center, you can create your own site pages; whereas, in a Basic Search Center, Search results are displayed on a system page where we cannot customize. You can only edit the search and search result pages that the template delivers. Create a Search Center site collection. Open the SharePoint 2016 Central Administration site >> Application Management >> Create new web application and top level site collection with enterprise search center template. This PowerShell script creates new web application and enterprise search center site collection. $WebAppName = "Crescent Search Center"
$AppPoolName = "Crescent Search Web Application App Pool"
Once search center site is created, you must grant permission to all users in the organization in order for them to access search center site. Go to : Site Settings >> Site Permissions >> Enterprise Search Visitors Group >> Add "Everyone"